Justin Jackson carries the ball. The senior ran for 18 yards against Duke, the smallest single-game output of his career. DURHAM, N.C. — There was a moment in Saturday’s beatdown at Duke when Northwestern’s defense incorrectly thought it had too many men on the field and ran its 11th man off. It was the only time in the game the Wildcats (1-1) played with 10 men. But it was far from the only time it seemed like they did. Against a Blue Devils team fresh off a 4-8 season, NU faltered, losing the yardage battle by a 538-191 margin and the points battle by a 41-17 score. The 24-point margin was the biggest in any non-conference loss during coach Pat Fitzgerald’s tenure. Junior quarterback Clayton Thorson, coming off a spectacular performance last week against Nevada, was knocked off his game early on by a relentless Duke (2-0) pass rush and never got on the same page as his receivers. Thorson went 11-for-29 through the air for just 120 yards and two interceptions, and Fitzgerald said many of the incompletions were the fault of his inexperienced receiving corps running bad routes. Yet even Thorson was able to find more success than his counterpart, senior tailback Justin Jackson, who tallied 18 rushing yards and was essentially abandoned in the second half. “I’ve got to start completing more passes in order to free up that running game,” Thorson said. In their last possessions of each half, the Cats moved the ball well, catching Duke off guard with a quick-paced drive to cut the halftime score to 21-10 and adding a garbage time score late. Jackson ran for his first touchdown of the season and senior backup quarterback Matt Alviti threw his first career touchdown. In between, though, NU had nothing going. Defensively, a secondary left undermanned after senior corner Marcus McShepard’s last-minute absence was dealt a critical blow with a targeting call in the first quarter. The call resulted in the ejection of junior safety Jared McGee, negated a red zone interception and set up the Blue Devils’ opening touchdown. The hosts never looked back. Duke quarterback Daniel Jones threw for 305 yards on 29-of-45 passing, ran for another 108 yards and totaled four touchdowns on the day. 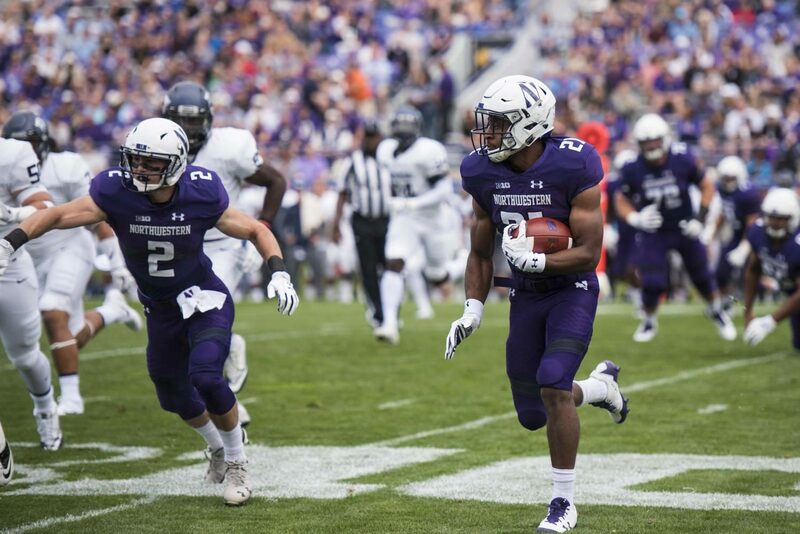 With NU’s last-gasp secondary playing well off outside receivers, Jones was able to find plenty of room to hit out routes for 7-yard gains or scramble for long gains himself. As a result, the Blue Devils went 15-for-22 on third down while the Cats converted just 1-of-10. NU did kick well all afternoon — senior punter Hunter Niswander averaged nearly 50 yards per punt and freshman kicker Charlie Kuhbander drilled his only field goal, a 40-yarder — in a dose of fitting irony, given the special teams issues that have long plagued the Cats in far more winnable games. As far as the too-many-men controversy, Fitzgerald said he could’ve called timeout, but instead let the team try to overcome the gaffe.